Our club has its own asteroid! In January 2010, The Harvard Minor Planet Center (MPC) approved the renaming of asteroid 2000 EO148 to Asteroid SALSA! Asteroids are small, rocky bodies, which mainly inhabit a large ring of similar space rocks between Mars and Jupiter: the Asteroid Belt. The image (below center) shows how Asteroid SALSA actually appears from Earth - a small point of light moving across the star field. Look near the left center for the moving dot! The image was taken via remote control of a large telescope in Chile. 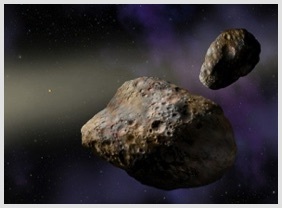 The artist's depiction (bottom right) shows how Asteroid SALSA might appear from a distance of a few thousand kilometers. IAU Citation: "The San Antonio League of Sidewalk Astronomers, is an astronomy club whose passionate members are dedicated to sharing the night sky with everyone in a fun and friendly environment." Asteroid SALSA: Our Club Member in Space!